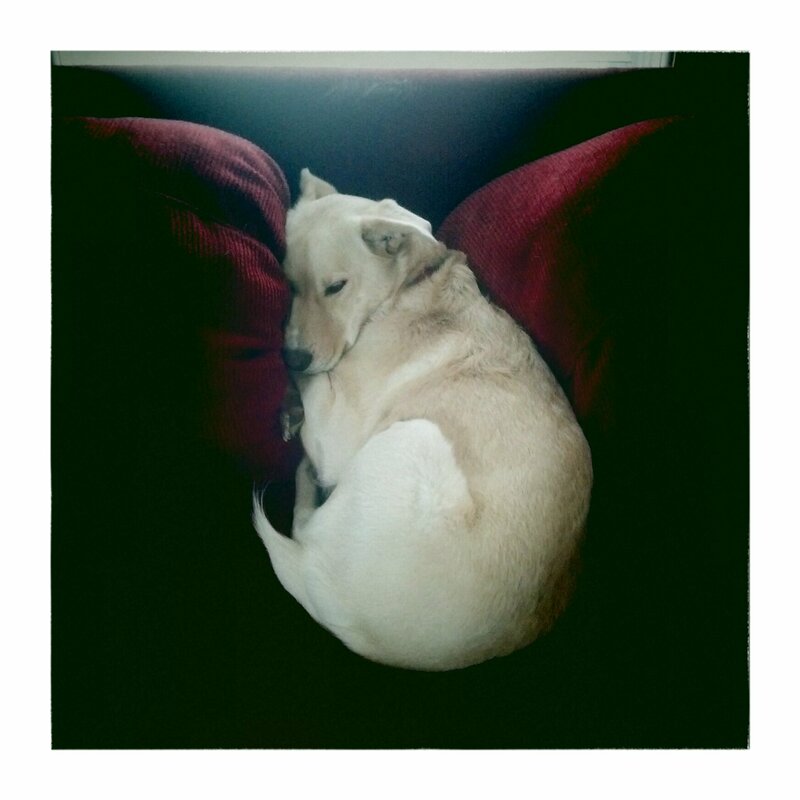 Chuck napping after our run. I knew as soon as I posted about the “good weather ahead” last time, I would jinx myself. But other than a large snowstorm mid-week, which once again threw a wrench in my training schedule, it was a pretty uneventful week here. I ran. I read. I knit. We built a snowman in the backyard. Nothing terribly exciting. I did cook some yummy food while stuck inside this week so I have recipes to share soon. I made it almost all the way through my first magic loop sock. It was fairly easy to learn thanks to verypinkknits videos. I’ve always hated knitting with double-pointed needles, so I was happy that the Magic Loop Method worked so well. 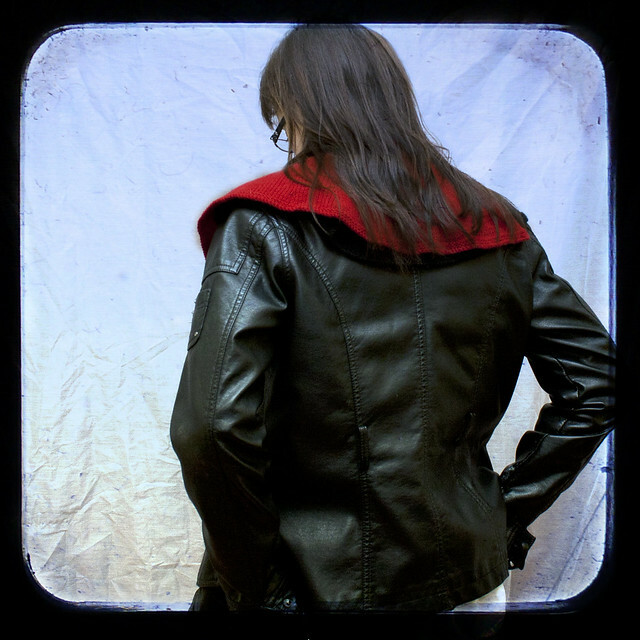 I frogged the cape I was working on. It was getting too tedious and the loose stitches between the color changes was driving my perfectionist mind nuts. I decided to quit before I got too far ahead – or behind, however you want to look at it. Maybe later I’ll try the cape again (with the proper yarn this time), but I’m setting it aside for now. 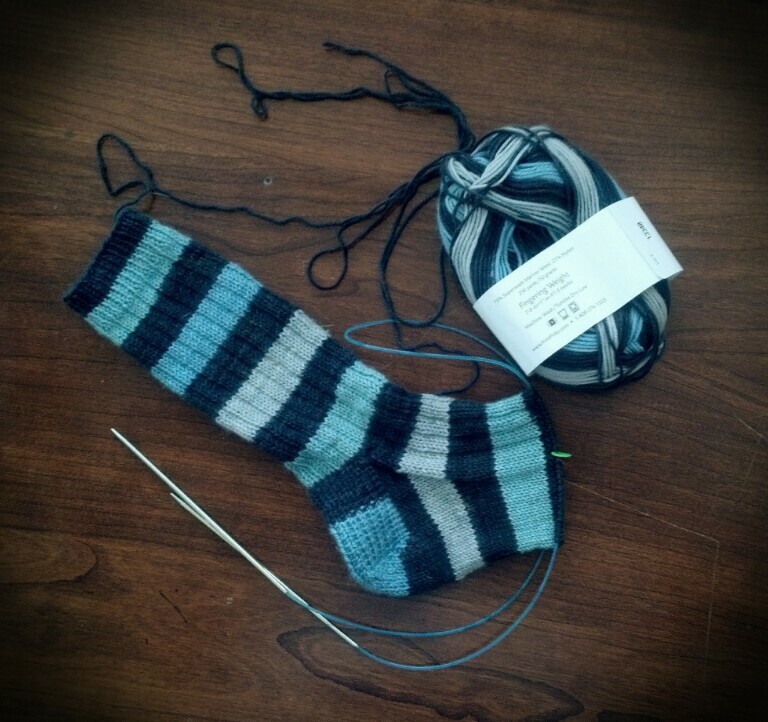 In the meantime, I’ve found another pattern to knit after I’ve finished my socks. Thursday: 30 minutes running circles in my basement with my Wii Fit while watching the mid-day news. I played some of the games for another 15 minutes. According to my son’s science fair experiment this counts as legitimate exercise. Besides, I was snowed in and this was my only option. 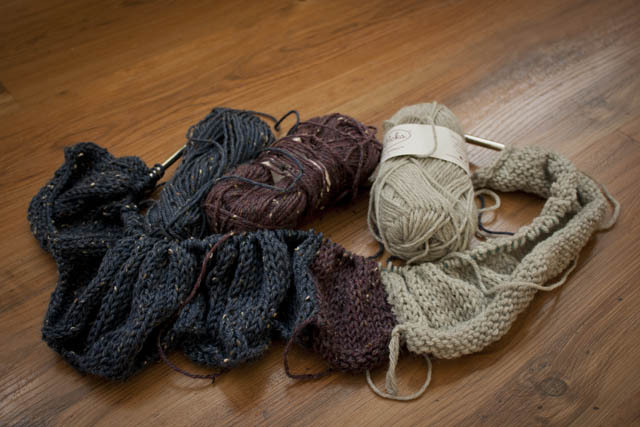 Sometimes I like to knit long and involved projects, like sweaters and lace shawls. I like to watch the fabric grow and the garment take shape. 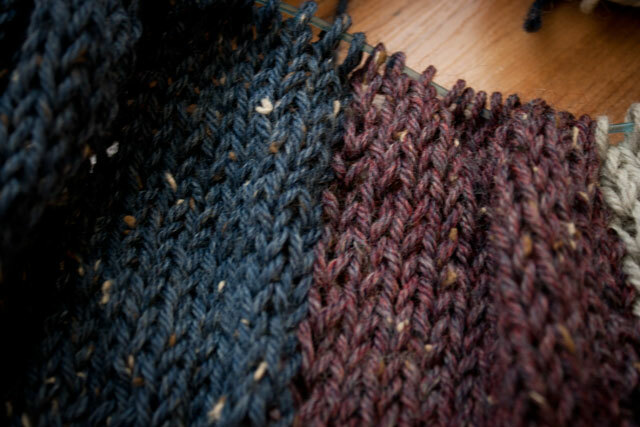 Pieces that involve lots and lots of stockinette stitch can have a meditative quality to them. In the colder months, they are comforting and cozy to knit. 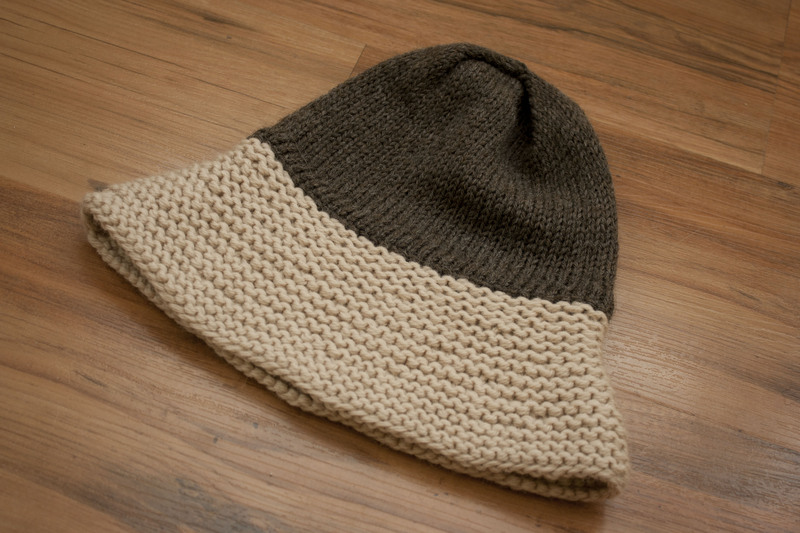 And a project knit over a weeks, or even months, provides a nice feeling of accomplishment when I’ve finished. But other times I need some instant gratification. I want results NOW! And smaller projects are always easier to pack along to the kids activities, doctors offices, or anywhere else I’m stuck waiting awhile and it is either too noisy, or I’m just not in the mood to read. After knitting the Cormorant and Osprey, I was definitely ready for some instant gratification knitting, but I also wanted to learn something new. I found 2 patterns that filled my needs perfectly. The first project was a Vogue pattern for a brimmed hat. I’ve had it in my binder for awhile but I always found something I wanted to knit instead. And I could never settle on a yarn. I thought it might look cute paired up with my new sweater, I even had some yarn left over so it would match perfectly, so I cast on. The new skills were: a knit casing around the base of the crown for an elastic band and 3-needle bind-off. The casing was a little awkward to work, but not too hard to figure out. The 3-needle bind-off was easy-peasy. Unfortunately, the model for the pattern looks much better in the hat than I do. This hat will probably never be seen on my head. If my daughter or my mom do not want it, it will probably go into the donate pile. It turned out nice though. I’m sure somebody will get some use out of it. 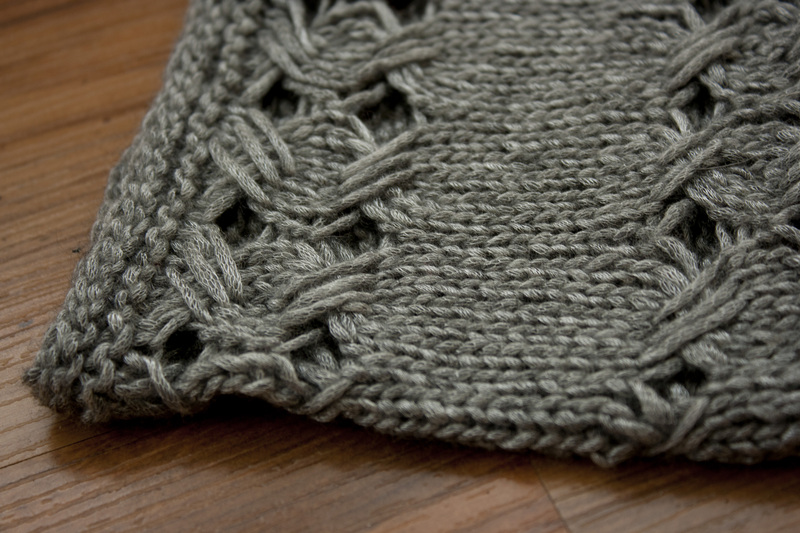 The second project I knit was Elis – a cowl that has a unique texture featuring Indian-Cross-Stitch. I used Sublime Yarns Lustrous Extra Fine Merino, which is so soft and shimmery. I was intrigued by the cross-stitch. It was a bit awkward at first, but once I got the hang of it, it went pretty quickly. I had to be very careful to keep the tension even so my dropped stitches would all be the same length. I also had to watch that I passed the stitches over in the right order. They would sometimes get twisted, or fall off the needles, so I had to sort things out before I could forge ahead. I really like how this one turned out. The cross-stitch added a unique detail to the cowl. The yarn is warm, but lightweight. It will be a nice piece for spring-time, which according to Punxsutawney Phil should be here before we know it. And I need spring to be here soon. I’m going through running withdrawal. I got out twice last week and I am itching to get back out again. We finally got snow, and lots of it. I’m going to take Chuck out for a walk in a bit to see if there is enough snow cleared for a safe run before the next snow band hits later this morning. Otherwise, I’ll be confined to indoor workouts for at least a week more. Maybe I can at least get out this week to snowboard with the kids, but this mama needs to run. About a month ago, I finished my second sweater of my knitting career. It’s the Cormorant from Norah Gaughan’s Flyaway pattern book. As I said in my previous post, it was an intimidating pattern for me to start, as I’m still fairly new to knitting and my confidence isn’t always there. But I like a challenge, and I really liked the sweater, so after successfully completing the Osprey scarf, I decided I could handle the Cormorant (my project notes are on Ravelry). I’m pretty darn proud of myself. There are a few small mistakes, but nothing terribly obvious. And my shoulder seaming looks much better than my last attempt. No bumps or puckers this time. I still need to find a button for it, but until then I think the shawl pin works nicely. It was a nice pattern to knit. 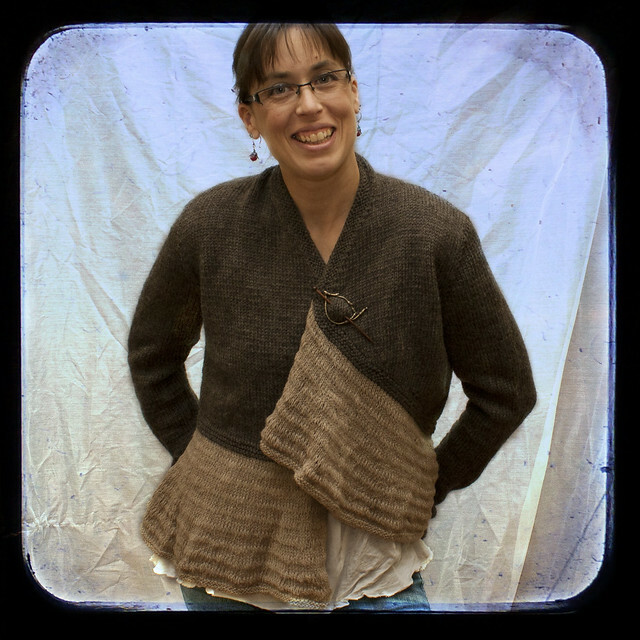 I used Wool of the Andes for the main body and Palette for the ruffle. Both yarns are available from Knitpicks. I’ve been knitting on a budget lately, so Knitpicks is my usual go to place for inexpensive but nice yarns. Some knitters on Ravelry commented about the amount of stockinette stitch on the sleeves being boring. I actually didn’t have a problem with that. The ruffle was where I got frustrated. There were so many stitches on the needle, my knitting felt like it was going nowhere. While I was knitting it, I kept thinking of those birds you see flying into the wind on super windy days, flapping with all their might and not getting anywhere; I was knitting for hours but not seeing much progress. Eventually the ruffle was finished and I think the end result was worth it. The sleeves are extra long, which might bother some, but I love them that way. I’m always cold, so I end up pulling the cuffs of my sweaters and knit tops down over my hands to keep warm. With this sweater I don’t have to pull, the sleeves already cover my hands. The back neck extension is a little tall. It doesn’t bother me too much as I have a long neck, but I don’t like how it makes the collar lay. It tends to bunch and slouch after I’ve been wearing it for awhile. I don’t know if there is any way to help it keep straight and tall – probably not. I gained some more confidence in my knitting with this project. And I definitely feel better about seaming and picking up stitches now that I’ve finished this sweater. 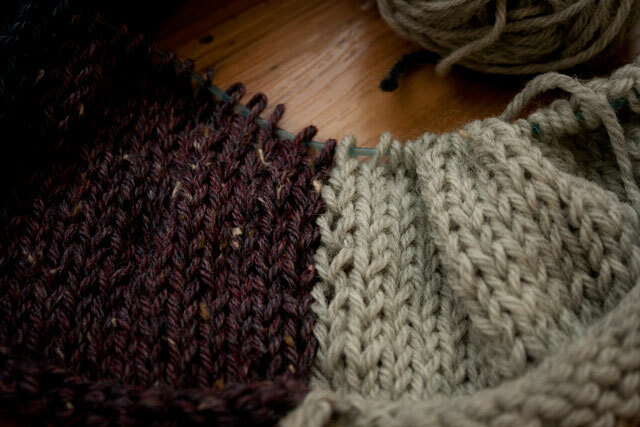 Right now I have couple of small projects in my knitting bag – a cowl and some washcloths. After this sweater, I wanted some immediate gratification knitting before I tackled a larger project again. My sewing machine has been feeling very neglected lately. 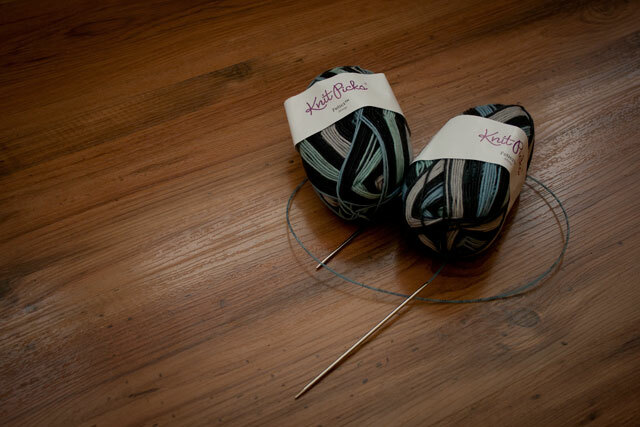 I’ve been smitten with my knitting needles. The warm, shiny metal and the clickety-clack sound they make as the yarn wraps around lulls me into an hypnotic trance every time. My sewing machine has meditative qualities also, but it’s so much more work to sew than it is to knit. I have to drag out crates of fabric, cut patterns, and clean up all the scraps. And the ironing……I really hate to iron lately. Knitting is portable. I only need a ball of yarn and my needles. I can knit anywhere I want. I can knit and watch movies. I can knit in the car while I wait for the kids to finish whatever activity they are participating in. I’ve even caught myself sleep-knitting more and more lately; closing my eyes for just a few seconds while my fingers continue to knit by feel. I inevitably wake up a few minutes later, mid-stitch, and on a good day, no dropped stitches. More often than not though, I spend the next 15 minutes cursing as I attempt to pick up all the stitches I dropped while a snored away – in a cute fashion, of course. I also needed some new sweaters, so knitting seemed more practical this season than sewing. I found a pattern book, Norah Gaughan Flyaway Vol 5 , last spring while on a yarn field-trip with a good friend. The sweater on the front caught my eye. I’ve only knit one sweater so far, and I haven’t been knitting long, so I wasn’t feeling too confident about my skills. The sweater also looked a little challenging, so the pattern book went into my binder while I knit perceived safer patterns. 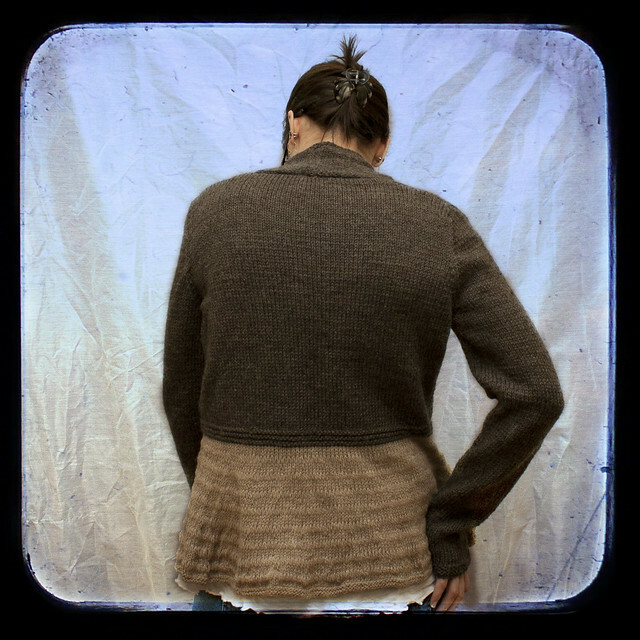 I would take the book out from time-to-time and admire the sweaters in it, but back into the binder it would go. With the colder weather approaching, I decided it was time to try. I was not quite ready for the sweater challenge. I decided instead to start with an easier pattern a little further along in the book. 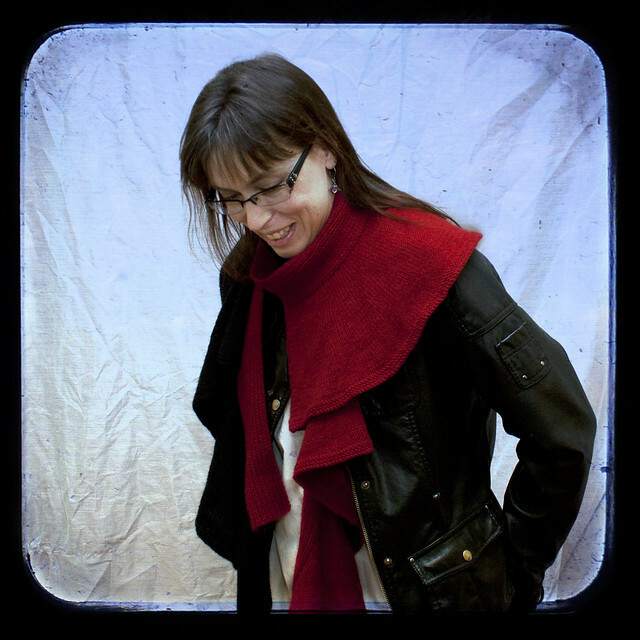 I chose the Osprey pattern – a unique, ruffly scarf pattern named after one of my favorite birds. I love it! It’s my new favorite scarf. I used the Berroco yarn suggested with the pattern for the red, but for some reason I didn’t buy enough yardage of the Alpaca Ultra Fine for the ruffles. I didn’t feel like making the trek to the yarn shop for more yarn. Instead, I unraveled my unsuccessful shrug from last summer (that I never extended into a scarf) and used that yarn for two of the ruffles, and the red for the other two. So it has alternating black and red ruffles. I like it and think it turned out pretty. The yarn is nice and soft and has a nice drape. It’s versatile. 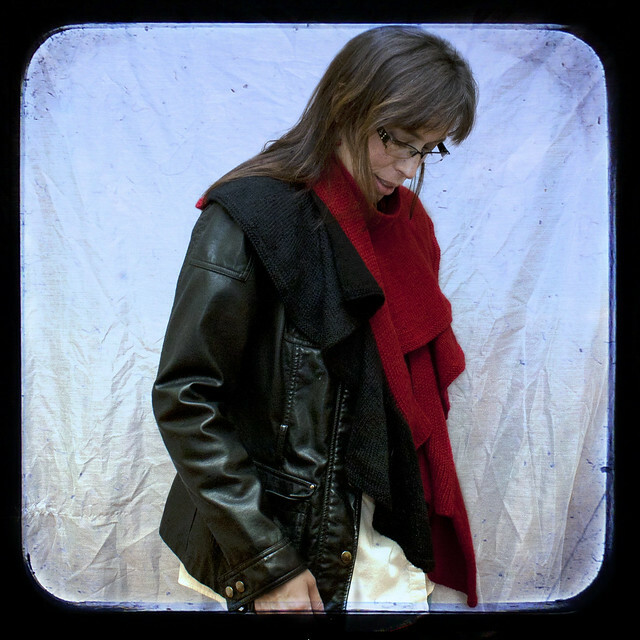 It looks great with a leather jacket, a sweater, or blouse. 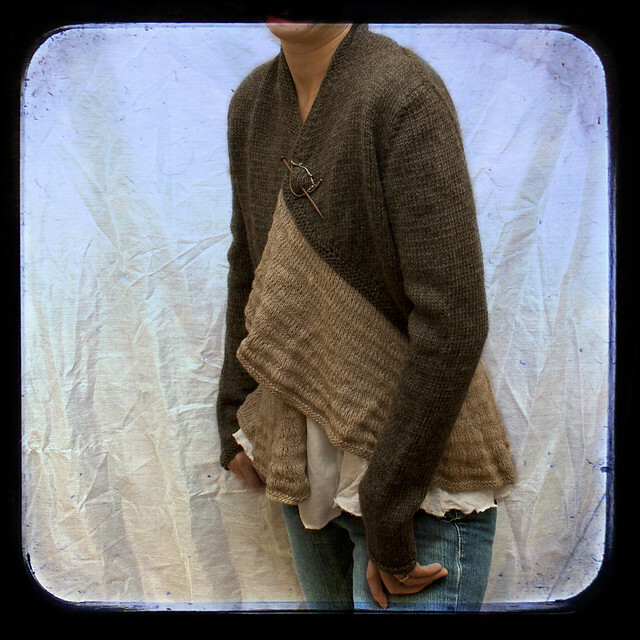 And the way the flounces drape around the back, it adds a little extra warmth on cool days. It was an easy knit, although I struggled with the Flounces after the second one, but not because they were difficult. The repetition was boring, and I was ready to move onto something else. I did end up knitting the sweater on the cover. I’ll share that in the next post. I should be back to sewing soon. I’ve been pinning sewing patterns and fashion ideas again on Pinterest, so it won’t be long before my sewing machine is once again getting the attention is deserves.